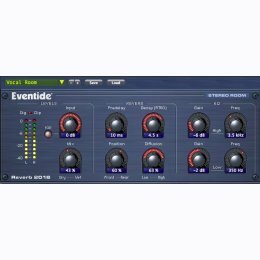 Long used as an essential reverb for mixing hit records, the Eventide SP2016, while long discontinued, is still in use in places like Ocean Way. Some digital reverbs don't have the horsepower to run a sufficiently complex program to achieve "naturalness." Without enough processing power the effect will suffer from low echo density or unnatural density growth with time or comb filter effects, etc. The art of reverb algorithm design begins with simulating a 'room' that actually sounds good. Needless to say, rooms exist in the real world that sound awful. The structure of the reverb algorithm combined with the choices of delay lengths, interconnects, filter placement, early reflections, etc. all contribute to the overall sound. The final element of the art of reverb design is the designer's choice of the ways in which, and the extent to which, the artist/engineer/producer is permitted to modify the effect. Now, the top favorite reverb algorithm from this sought after hardware box is now available for Pro Tools AAX, VST, and AU.